so the sums of the integers on each side are equivalent. Terry taught several years in the U.S. before moving to El Salvador (1981) to work at the Escuela Americana in San Salvador. His main focus and experience was in the upper elementary and middle school levels. 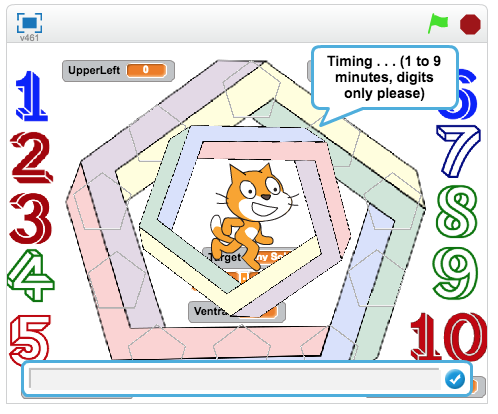 “Trotter Math” were topics and ideas that interested Terry in particular, and proved to be interesting to students that appreciated and responded to his style of lessons and activities. ​There are twelve known solutions (with reflections and rotations) for the sums 9, 10, 11, and 12. There are no solutions discovered for sums less than 9 or greater than 12. There are six known solutions (with reflections and rotations) for the sums 12 (one, 13 (two), 14 (two, and 15 (one). There are no solutions discovered for sums less than 12 or greater than 15 using consecutive integers. There are eighteen known solutions (with reflections and rotations) for the sums 17 (two), 19 (four), 20 (six), 21 (four), and 23 (two). There are no solutions discovered for the sums 18 and 22 or for less than 17 or greater than 23. There are only six known solutions (with reflections and rotations) for the sums 14, 16, 17, and 19. There are no solutions discovered for sums less than 14 or greater than 19, nor are there known solutions for the sums 15 or 18. There are 140 known solutions (with reflections and rotations) for the sums between 22 and 30. There are no known solutions discovered for sums less than 22 or greater than 30. There are twenty known solutions (with reflections and rotations) for the sums 17 (three), 18 (one), 19 (six), 20 (six), 21 (one), and 22 (three). There are no solutions discovered for sums less than 17 or greater than 22. 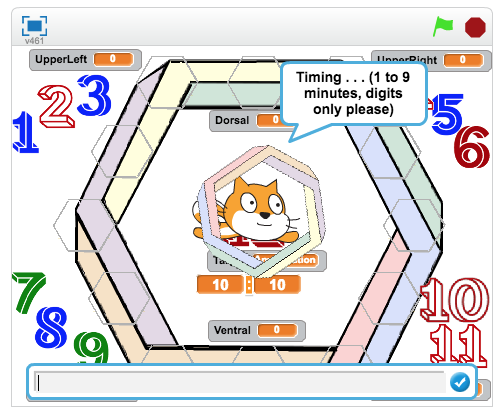 ​Concept: Idea based on original math puzzles created by Terry Trotter (1941-2004), 1972. http://www.trottermath.net/simpleops/pmp.html. 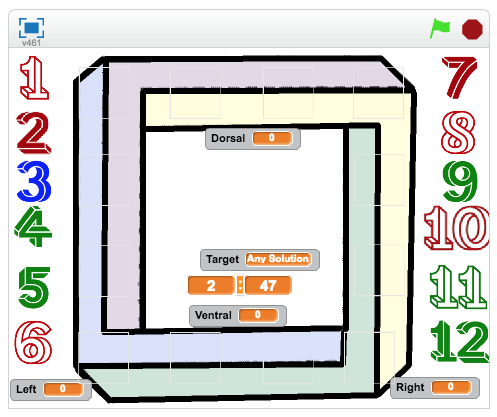 Solutions based on analysis by Harvey Heinz shared at http://recmath.org/Magic%20Squares/magicsquare.htm. 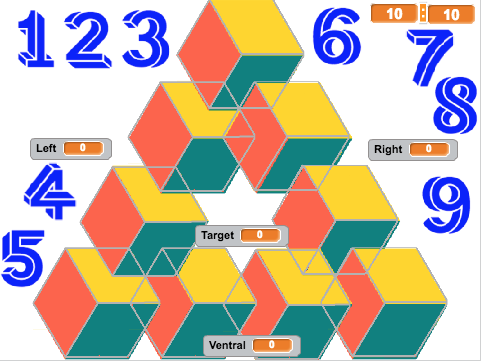 Artwork in the Scratch programs: The Penrose triangle was first created by the Swedish artist Oscar Reutersvärd in 1934; psychiatrist Lionel Penrose and his mathematician son Roger Penrose independently devised and popularized it in the 1950s, describing it as "impossibility in its purest form." Font in the Scratch programs: Macula, the Impossible Typeface, by Netherlands designer Jacques Le Bailly, a.k.a. Baron von Fonthausen.